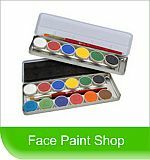 We are a Polk County Licensed Face & Body Art Business providing professional and safe facepainting for all ages. We offer Balloon Twisting, Belly Painting & Glitter Tattoos with 7 years experience. We service Lakeland,Bartow, Auburndale, Mulberry, Winterhaven, Plant City and surround Polk County Area.